Have you ever lost something thinking the worst, only to find out it wasn’t really lost because you had it all along? 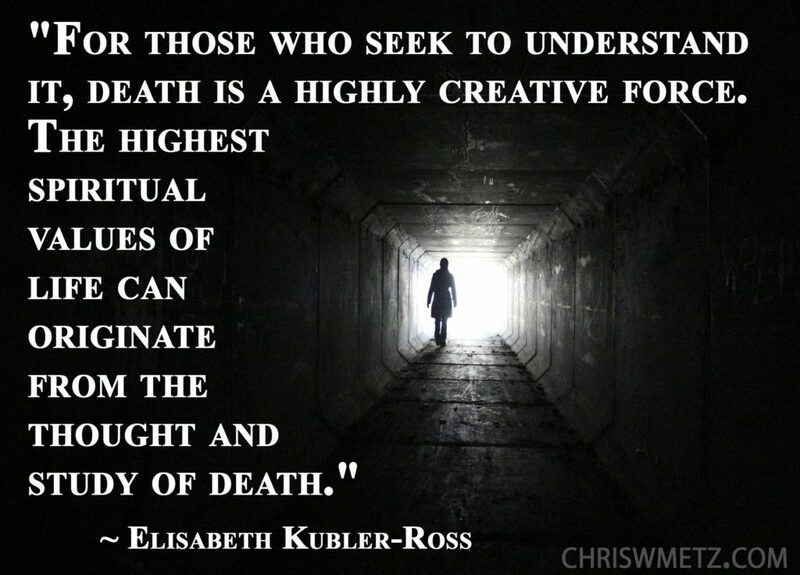 Since death is a part of life, if we embrace it fully what can we learn from it? What is the ultimate lesson death will teach us about how we lived our life? We live our life with little to no consciousness of our death. Because of this we miss a big part of what it means to live a physical life. Imagining the moment of our death we might come to realize a sense of peace we could not fathom during life. When physical life falls away and we leave the body, we leave behind all the drama, pain and fear associated with it. In this split moment the barrier to infinite peace and love is removed or drops away. First and foremost, we would realize we are still alive or the awareness of who we are continues after death. From this once again familiar perspective we realize how trivial so many events have been in our life. This sudden catapult of consciousness occurs because our perspective is shifted dramatically. The worry of being late while stuck in traffic; the family and friends who didn’t do what we expected them to do; the worry of what other people thought of us; the fights we had over trivial matters; all these things will be put into perspective once we have experienced the gift of death. So what is a physical life? As we look back on our life we will see it as an experience. An experience where we picked our circumstances, personality and general theme for our life. Similar to going to an amusement park we may look back and reminisce at the joy and terror we experienced with those choices. We may also wonder what we missed by not going on certain rides. If we choose we can then experience countless simulations of what it may have been like had we chose differently. The true lessons however can only be experienced with an actual physical experience. What does viewing our life from the perspective of death give us? We will witness the countless scenarios of drama that occurred all around us and laugh at it’s meaninglessness. All in all we will come to view it as just one experience out of many. From this higher perspective we will come to see who we decided to be through all of it. We will see objectively why we made certain choices and the experiences that ensued. We will wonder why we were so afraid of being ourselves and pursuing our passions in life. We may wonder why we never chose to be passionate about anything. Interestingly we will not regret with the set of emotions that overwhelmed us during physical life. It will all be looked upon objectively with a non-judgmental review of our experience. We will see the life just left as one experience with a theme. Those themes are endless but in fact we will come to realize it was a theme we ourselves picked ahead of our experience. Perhaps we wanted to pursue some creative musical pursuits or wanted to see the effects of a high intellect; to see the effects of extreme poverty, adversity or extreme wealth. The point is it will become very clear to us as we view it from a newfound vantage point of death. When we come to the full realization of our eternal nature and the bliss and joy of our natural spiritual state, we will view physical life as a brief interlude of earthbound experience. An earthly presence allows us to experience so many facets of emotions and lessons in free will choice. Just like a simulated video game, when it is over we will see it in much the same way. Why is this? We will regain the awareness of our eternal soul. We will know our consciousness exist forever and nothing can or ever could hurt us. From that perspective you cannot help to realize how silly it was to take things so seriously. You will see the fear that enveloped you during life and the pointless nature of trying to live up to other peoples expectations. The pain caused by non-loving behavior will be experienced first hand by reviewing those moments from the eyes and hearts of those you hurt. You will see the vanity of trying to impress others with anything other than your inner loving radiance. You will come to realize the story of life was not about other people, it was only about yourself. The lessons, experience and wisdom you gained in life was your own personal story and you were the sole author. Coming back from death, what could we learn about life? Having embraced death fully if you could then jump back into your physical body (not that you would want to of course,) you would start to live in a completely different way. You would realize the extension of love is the most important overriding theme beyond any personal theme you choose for yourself. You would not let the little things in life bother you, you might even remember they’re all little things. You would remember that each person is fulfilling their own set of experiences, balancing their own karma and writing their own story. We would not be so quick to get drawn into another person’s drama. Perhaps we would remember to introspectively critique our own story instead of spending time critiquing the story of others. We would realize the lesson in life is using free will to decide who we want to be. This we do as we react to everything presented to us. Most of us believe the experiences in life make us who we are. But in reality it is who “we” decide to be. We all face certain difficulties in life. The question is do we face them with a compassionate heart or do we face them with anger, contempt, selfishness and hatred? Do we accept responsibility for our role in life’s events or do we blame others for everything? Do we take responsibility for making our life all it can be or do we have a sense of entitlement taking from others instead? Do we have integrity to ourselves? or do we lie to our self so we don’t have to face who we are during this life? There is always a voice inside us that tries to guide us to the right decisions. Are we listening? We go through life mostly unconscious of our eventual death. We only become more conscious of it as we draw closer to death. We might even feel we have lost most of life as a result of this unconscious sleep during most of it. Death will present us with the blessed knowledge that we can never lose life. It will show us eternal life has been with us all along and we only thought we lost it during our physical human experience on earth. Close your eyes and think about someone you knew well, that died of old age. Try to think of what they struggled with in their own life. Try to figure out what they chose as the theme for their life. Think of how they aged and the changes that took place in their life. Towards the end of their life, ask yourself if they cared about the same things they might have during the middle of their life. Do you think their priorities changed? As they got older did they ever express to you any regrets they had, or things they wished they had done differently? Now that they are gone, do some of the things they used to get upset about seem trivial in nature? Now, do you see a positive theme in your life? Can you imagine, now that you are gone how your anger at someone might seem trivial? Can you imagine the things that used to annoy you and how they may seem insignificant to you now? If you had hatred for anyone can you see how it only served in hurting yourself? Can you see that you were ultimately the casualty of your own hate? Can you see how this hatred may have shaped your life maybe even altering your experience of what you could have become? As you think of all this, can you change your awareness of your life by seeing all of it as a grand theme? If someone asked you to name the top three things you learned in life, what would they be? We come into this life by design. Whether we are conscious of it or not, we picked our circumstances for the purpose of learning and to work through our karma. Even if you don’t believe this, you will still gain a great benefit by asking yourself what you are supposed to learn, and what you have learned so far. If your reading this it’s not too late to change the course of your life by embracing death. This entry was posted in Calming The Mind Within, Self Awareness, Spirituality and tagged beliefs, death, life, self-awareness, soul, wisdom. Bookmark the permalink.